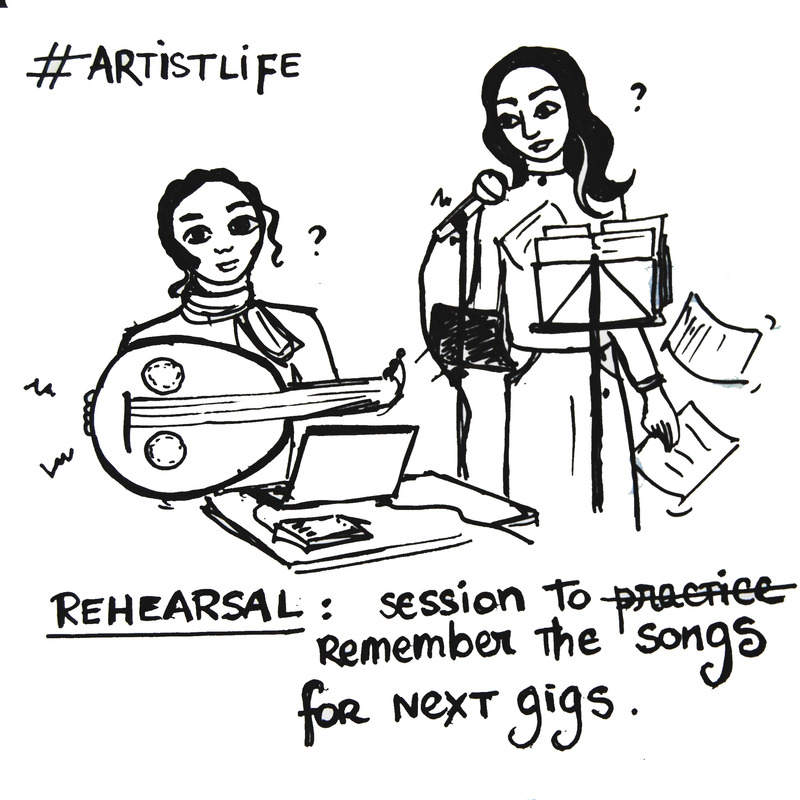 ArtistLife | . astrakan project . This unique piece of Artwork travels to Ireland as a reward for contributions to our Crowdfund campaign. Yann has been a few time to Ireland, but I haven’t so far… I’m hoping this painting is opening the road for me, it’s still a dream to go and visit some of the incredible megalithic sites as well as sites linked with Celtic Irish Culture. Performing there would obviously be a bonus 🙂 Let’s send this wish out into the winds! We are still only realizing how slowly incorporating my artwork into the project has become part of it, part of its identity, and has considerably impacted too the way we now envision projects. With the small audience we have, we probably wouldn’t have been able to reach the goal on the Crowdfunding campaign. The artwork is what has generated interest, it made it easy to post regular visual up-dates whereas posting music studio ones could feel a bit of the same. Once again, we are shown that what is hard to understand in the beginning is what makes us stand out and makes us different, and thus helps getting our project been noticed. In a way, the strong visual identity we’ve developed over the years balances the fact that the language we use can sometimes be an obstacle to dive in into our music. Now that we started to get fantastic and lovely feedback from people receiving the first orders, we also can feel how the visual impact the way they perceive the music afterwards – so far in a very positive way. Every music style is different, but in our case, we can confirm that we get to earn some money from hard copies sales while we barely make any sales on digital-only editions. We even had already a couple of people that ordered first the digital edition (that still includes the book in pdf) and re-ordered the hard-copy, and that was just the first week! Is there any conclusion? While we hear very often that digital is the future, we can see exceptions all the time, and personaly it’s not what we’ve been noticing (since 2012, we’ve released 3 hard-copies and 2 digital only). Is there any rule? And who makes up the rules? As artists, we are creative people, and being creative is also something we can apply to the way we connect with our particular audience. We still have a lot to learn on that field, but the last months of conceiving and releasing Inês project has certainly been very inspiring in that field. It has been considerable long time without any up-date from us. Probably because sometimes our progress is so slow that we even barely seem to notice any. For B album, I remember we started on the 1st of January 2014 on the very first drafts (though we had some ideas of compositions already, or had been working on them for live performances). Anyway, on the 1st of October 2014 we collected the promo samples freshly pressed from the factory. In the meantime we had recorded all the tracks, developed new sounds, new arrangements, done concerts in France, Belgium, and set up our 2 first UK tours, also set up all the legal side, made the artwork for the booklet, edited countless teasers and music videos. That’s 9 months sharp full time into music. For Project Inês album we must have got the idea around july 2014. Actually while working on the lyrics for Gwerz Inês. The story was so deep that we couldn’t choose a proper angle until we thought we would leave most of it for next album. Mid 2015 we were already doing some progress on the lyrics/music, and had many ideas about the concept. Broad lines, but most of it was there. At the end of summer 2015 the finances we had asside had gone, and we had to come back to Brittany full time where Yann has been mostly working full time as a teacher. We’ve done the best use we could of holidays for gigs/tours until 2017. We’ve had many ideas for Inês Project. Many. Many musical directions that didn’t work, mostly because we realised it wouldn’t be doable for the 2 of us to set up the ambitious sounds we had in mind at first. So we did what we always do: one step at the time, we do what is doable. We do with the limited time/money/means we have. We make the most of it, and try to go around limitations, turn them into challenges. Most of the time. At least we try. When we look back we realise that maybe, we also lost a lot of time by not being focused enough in what matters : creating music. Sometimes we get bitter, anxious, and only see the limitations. They are challenging limitations. Not travelling much is a major source of sadness for sure. Everytime you leave the music for something else, you need to get back into the mood. As quickly as possible! But there’s no other way than to do with what is, right? Lyrics are mostly all written, there might be a need for some changes as we go threw the vocals recording. We have all of the tracks structures, sounds, ambiances with minor changes that will occur once vocals will be in place. Most of instruments played by Yann are finalised (guitars, drums, ud and violin). We have a clearer idea about the guests and what they’re doing on which track. I have a structure for most of the artwork for every song. Get our guests’ tracks to add to the mix. Create most of the artwork – and there’s a lot to be created. Confession time: I need to have to music before I actually can paint. Probably that’s a limiting belief as well! Edit all the graphics for the booklet with all the lyrics + notes. Translate all the lyrics in French/English. Set up and launch the crowdfunding campaign. That’s a huge part! Includes a lot of promo, editing some videos too, printing some artwork for rewards too. And for that… we need the artwork ! Put that way, we can’ say there hasn’t been any progress ! Wish us luck and plenty of energy. 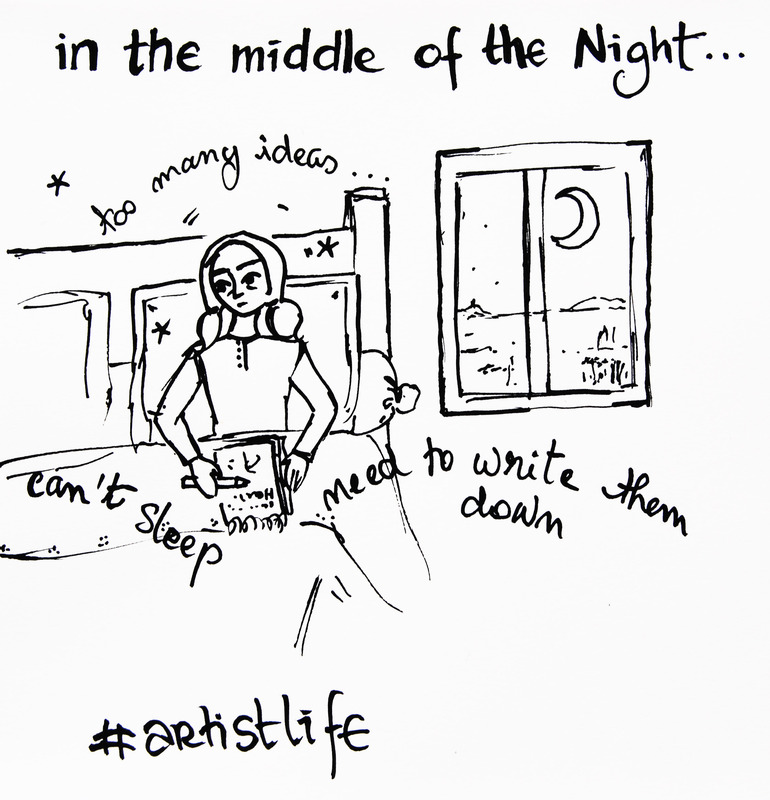 Ideas in the night… hunting artists! We can’t tell enough how bad both of us have slept recently! It always gets back to the same: since we are (unfortunately!) not touring this month, we started to work on a couple of side projects. We generally can’t stay long without trying out new things, but also we can’t just go from all the huge amount of work we did to release the album to just “being relaxing” – we need some kind of a transition. But as it always happens, the more we work, the more we get inspired, and the more ideas we get… until they start hunting us in the night. One part of the cure will probably be next gigs we’ll have in a month in France and UK! Finally some action!